Deep Island is a conjectural region that covers the river that runs between the Volcano and the Redwood Forests. 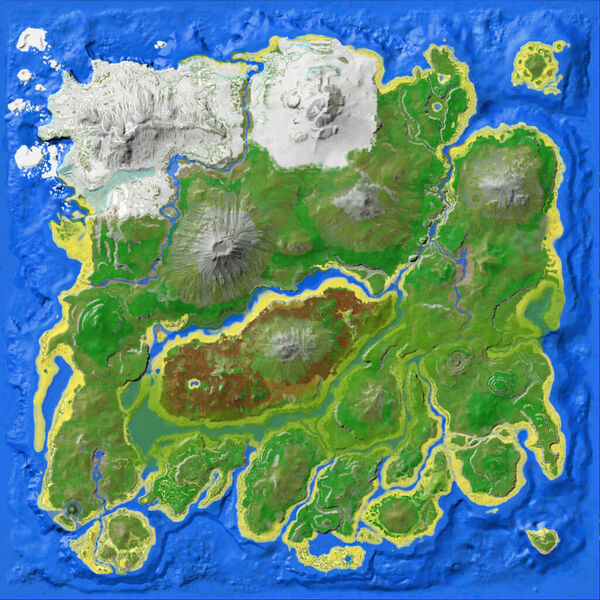 The name, Deep Island, used to cover the entirety of the Redwood Forests before the introduction of the Redwood Forests Biome, referring to the island within the center of map; but is now used to refer to the central area of The Island. The region name does appear in-game at sporadic intervals along the northern shore of the river, particularly to the west, which may be an oversight on the part of the developers when the new biome was introduced. The majority of this region is simply referred to as "Unknown Region", but has a unique and consistent spawn population. Part of the region is known colloquially as "Black Sands Beach", due to the ashen colored ground on the riverside south of the Volcano. The Volcano and The Maw reside to the north and the Redwood Forests to the south. To the east, the river forks toward Smuggler's Pass and Writhing Swamps, with the river to the west also connecting to the swamp. Some resources may be missing until further study. It is not rare for creatures from the Redwood Forests, The Maw or Volcano to migrate into this region, such as the Archaeopteryx, Castoroides or Argentavis.